Our product range includes a wide range of stevia seeds, basil seed / sabja seed / tukmariya seed, tulsi seeds (cim-ayu) and tulsi seeds (krishna / shyama). 8. It grows on most soils but prefers a sandy loam or loam, high in organic matter. 9. 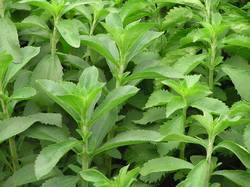 Market cost of dried stevia leaves Rs 80 to 150 Rs per kg. Total 4 harvest in a year. In each harvest around 500 to 750 kgs dried leaves are obtained. 12. Seedlings are ready for transplantation in 6-8 weeks. 13. It grows well in sandy loam soils with an ample supply of water. 14. This variety prefers acidic to neutral soil with a pH range of 6.5-7.5 for its best growth. It is grown in wide variety of soils. It gives best result when sown in sandy loam to loamy soil with good drainage system and high organic content. Avoid cultivation in saline soils as it is harmful for the Stevia. The pH ranging from 6.5 -7.5 is best for plant growth. Plant starts yielding in about 3 months after planting. Subsequent harvesting is done at the intervals of 90 days. It should be kept in mind that while harvesting 5-8cm of stem from ground level should left as such for regeneration. Four harvests is mainly done in one year. 5. Maintains heat stability at 95 degree and features a lengthy shelf life. Unlike artificial sweeteners, it doesn't break down with heat, so you can learn to cook with it too. 9. It has an excellent healing capability without scarring if placed on a cut. As far as health benefits are concerned, the seeds are full of fiber and known for many surprising health benefits. These seeds are used in making falooda, sherbet, milkshakes and other popular health drinks. It is known worldwide as one of the ingredients for sweet Asian drinks. However, like Chia seeds, it is comparatively less tasty. Basil seeds for weight loss: Sabja seeds can be used for weight management purposes. It is full of fiber that makes your stomach full and don’t feel hunger to a certain period of time. After soaking into water, it has the ability to expand 30 times of its original sides thus reduces longing for eating more. Sabja seeds for hair: The seeds contain adequate amount of vitamin K, protein and iron. These nutrients are helpful to make your hair healthy and shining. So, it is suggested to include it in your daily diet requirements to skip embarrassment from hair loss and baldness. Basil seeds for healthy skin: The mix of Sabja seeds and coconut oil is effective to ward off many skin related diseases. Method: Take 100 ml of coconut oil and 1tsp of crush basil seeds. Now heat the mixture for 5 minutes. Strain and apply it over your skin to cure skin related problems like psoriasis, eczema, etc. Basil seeds for acidity: Acidity problems are very common these days due to faulty lifestyle and wrong dietary pattern. Sabja seeds are having cooling and soothing effects on the stomach. Method: Take milk (1 cup) and basil seeds (1tsp), stir it well and drink the same to reduce burning sensation in your stomach. Sabja seeds for diabetes treatment: The seeds are good in curing of diabetes type 2 by lowering down the sugar in blood. Method: Take soaked basil seeds (1tsp), toned milk (1 glass) and vanilla for flavor. It helps to give you energy sans sugar. Relieves constipation: The soaked Sabja seeds when eaten helps to cleanse the inner stomach. It ensures easy bowel movement and helps to flush out toxin from the stomach. It is also taken with milk before going to bed to ease constipation. Acts as coolant: These seeds are used to lower body heat that’s why as one of the important ingredients in summer for a number of cool drinks such as falooda, rooh afza, nimbu pani and sherbet. Nutritional values of basil seeds: The seeds contain many phyto-chemicals and polyphenolic flavonoids like Orientin, vicenin and other antioxidants. The leaves are rich in essential oils like eugenol, citronellol, limonene, citral and terpineol. It contains beta carotene, lutein, zeaxanthin, vitamin A and vitamin K. It also contains important minerals like potassium, manganese, copper, calcium, folates, and magnesium. The new variety of Tulsi has a higher aromatic compound compared to other varieties. It will provide aromatic compound required by perfume, incense and aroma industries in abundance within a short duration. CIM-Ayu has 83 % of Eugenol which is usually extracted from cloves and has high extraction cost as it's not available in bulk. The plant is sufficiently hardy and it can be grown on any type of soil except the ones with highly saline, alkaline or waterlogged conditions. However, sandy loam soil with good organic matter is considered ideal. The crop has a wide adaptability and can be grown successfully in tropical and sub-tropical climates. Long days with high temperature have been found favourable for plant growth and oil production. The first harvest is done after 90 days of planting and subsequently, it may be harvested at every 75 days interval. The crop is harvested at full bloom stage by cutting the plants at 15 cm from ground level to ensure good regeneration for further harvests. The yield and oil content is more in plants harvested during bring sunny days. On an average, tulsi gives about 10,000 kgs of fresh herbage per hectare per year. Krisha Tulsi is also known as ''Shyama Tulsi'', ''Kala Tulsi'', ''karun Thulasi'', ''Ocimum Tenuiflorum'' , ''Purple Tulsi'', the Purple leaf Tulsi is famous for its peppery, crisp taste. 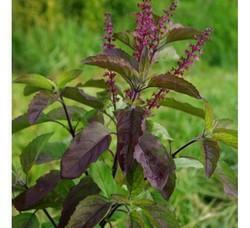 Krishna Tulsi is the right medicinal Tulsi as it has more potency. Although it is grown in many regions in India, it is relatively more difficult to find than the green varietals. 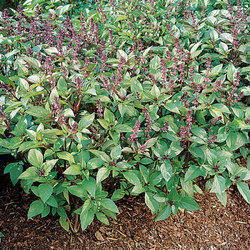 Compared to the other species of Tulsi, Krishna Tulsi takes a longer time to grow. It is believed that this is the reason for its spicy and crispier flavour. The leaves are less bitter as compared to other types. The parts of Tulsi generally used are leaves, flowers, seeds, stems and dried roots. 1. This variety is more useful in curing lungs problems. 2. This Tulsi is consumed as Herbal Tea. 3. This Tulsi is known to be beneficial to treat throat infections, respiratory system, nasal lesions, earache and skin diseases. 4. This Tulsi helps in curing Malaria. 5. This Tulsi is very effective against indigestion, headache, hysteria, insomnia and cholera. 6. This is also believed that the aqueous extract of leaves taken with honey for 6 months expels kidney stones. 7. This Tulsi Leaves, when chewed, relieve mouth ulcers and infections. 8. This Tulsi Leaf extract is effective to treat skin disorders like ringworm etc. 9. This Tulsi Dried leaf powder is used for brushing the teeth. In the preparation of toothpaste for dental health. 10. This Tulsi Leaves are used to treat sore eyes and night-blindness. 1. Krishna Tulsi seeds germinate after a while, so be patient once you sow them! 2. The seeds are mainly sown in the spring season. 3. They are watered from time to time and germinated in one to two weeks. 4. Tulsi prefers rich soil for its growth. 5. It requires full sunlight. 6. It is mainly grown in the temperate climate. Looking for Agricultural Seeds ?